Davenport Caps Wild West Shootout Title with $11K Score! 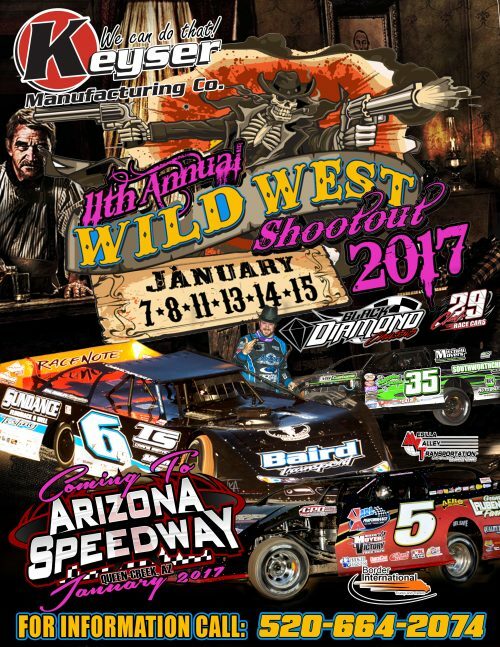 Lonnie Wheatley, TUCSON, Ariz. (January 17, 2016) – Jonathan Davenport put an exclamation point on his Keyser Manufacturing Wild West Shootout presented by Black Diamond-Club 29 Race Cars Super Late Model championship by topping Sunday night’s $11,000-to-win series finale atop the 3/8-mile USA Raceway. Davenport raced into the lead just past the midway point of the 50 lapper en route to picking up the winner’s share that was boosted by AR Bodies. It was his third win of the six-race series aboard the TS Crane Service/Sundance Services No. 6 Longhorn-chassis.